Presenting Moose Murders, the "Worst Play Ever on Broadway"
After overwhelmingly negative reviews from theater critics who appeared to relish the chance to sharpen their knives, the play debuted at the Eugene O’Neill Theatre on February 22, 1983—and shuttered the same night. (Even Spider-Man: Turn Off the Dark ran for over two years.) According to the BBC, which produced a nearly 10-minute radio segment about the infamously awful play, Moose Murders is "the standard against which all other disastrous plays are judged." AARP The Magazine examined the biggest flops of the entire 20th century—and placed Moose Murders at number five (just behind New Coke). “I was thought of as a promising young playwright in the vein of Albert Innaurato,” Bicknell told Playbill in 2012. He had penned My Great Dead Sister: World of Domesticity, a “serious light comedy,” which earned strong reviews from the very critics who would later eviscerate him. 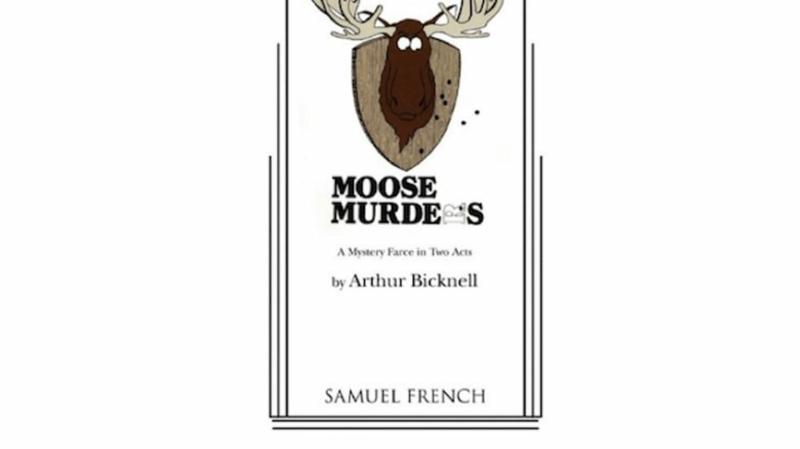 For Moose Murders, Bicknell was attempting to lampoon stage conventions by writing a farcical murder mystery. He was inspired by the 1906 murder of Grace Brown, who was drowned on the South Bay of Big Moose Lake in the Adirondacks in upstate New York, where Bicknell’s family had a home. “Everything up there is called ‘Moose,’ and that’s where the title came from. I wanted to write a farce and ‘Moose’ is a funny word,” the playwright reasoned. The wealthy heirs of a wealthy but ailing old man named Sidney Holloway have purchased the Wild Moose Lodge in the Adirondacks as a place for daddy to live out his last days. During an innocuous game of "murder" suggested by one of the clan, mousey young Lorraine Holloway is murdered for real. Who done it? Could it have been the legendary "Butcher Moose" which haunts the mountains? Or, is it a member (or members) of the eccentric Holloway family itself? Before dawn breaks, there are a series of disclosures which lead to the murder of more than one of the cast of loonies as well as to the awful truth behind the "Moose" murders. The wealthy Hedda Holloway, the lodge's new owner, arrives with her husband, Sidney, a heavily bandaged quadriplegic who is confined to a wheelchair and who is accurately described as ''that fetid roll of gauze.'' Sidney's attendant, Nurse Dagmar, wears revealing black satin, barks in Nazi-ese and likes to leave her patient out in the rain. The Holloway children include Stinky, a drug-crazed hippie who wants to sleep with his mother, and Gay, a little girl in a party dress. Told that her father will always be ''a vegetable,'' Gay turns up her nose and replies, ''Like a lima bean? Gross me out!'' She then breaks into a tap dance. Bicknell has always been quick to point out in interviews that people initially found the play funny; it wouldn’t have been made in the first place if everybody thought it was terrible. A wealthy Texas oil baron found the script particularly amusing, and agreed to produce the play. The foreshadowing of a historic failure coming down the pike came soon thereafter. The play's director—first-timer John Roach—cast his wife, Lillie Robertson, as Lauraine Holloway Fay, the oldest child of Hedda Holloway. Robertson created the part herself. To this day it remains her only Broadway credit. Eve Arden, who earned an Oscar nomination for playing Ida in Mildred Pierce, was planning to return to Broadway for the first time in 42 years by starring as Hedda; she withdrew from a Santa Barbara production of Barefoot in the Park for the opportunity. But Arden quit due to “artistic differences” after the first preview. She had wanted to change lines and was told she could do no such a thing; production personnel claimed she didn’t remember the original lines to begin with. Holland Taylor (The Practice, Two and a Half Men) briefly saved the day by replacing Arden, lifting the cast and crew’s spirits, but even she knew Moose Murders was doomed. “I had actually read the play and thought it was very very funny,” Taylor told the BBC. “But I didn’t think it worked as a play, and I thought it was extremely campy and just over-the-top.” She had heard the “scuttlebutt” around town about Roach casting his wife and considered it a “recipe for disaster,” and claimed to know the play “wouldn’t run.” She took the part for the money (Holland was in debt at the time), and negotiated a proviso that would allow her to leave the production with two weeks' notice if she got offered other work. One night, the play closes on a blackout laugh line, which is my line. One night, I said the line, it got its fairly weak response, and the lights did not go out. And the curtain did not come down. And that was the end of the play. The others all started scattering like rats on the ship. I said “Come back here!” And made them all come back and we stood in a line, took hands and bowed and I said, “That is the end of the play.” It was just one the most nightmarish moments of my entire life. No blackout, no curtain, end of play, on a weak laugh, with everyone standing there. At the after-party, the mother of one of Bicknell’s friends hugged him and told him how much she loved him, which made him cry. Bicknell spent the rest of the night drinking with friends and “talking about life.” Before he went to bed the next morning, he walked by the theater and saw the set getting unloaded. The wealthy Texas oil baron producer and his wife had escaped to Paris by Concorde. But Moose Murders was dead. Bicknell carried on. He wrote another play, and a midnight drag show. He went back to his job as an Air France reservations clerk. He worked his way up to becoming the chief publicist for Merriam-Webster. Somewhere along the way, someone requested his permission to stage a Moose Murders: The Afterbirth musical. Bicknell said no. But when Playbill caught up with him, he had co-created the Homecoming Players, a small theater company in Ithaca, New York. In 2013, he wrote a memoir, Moose Murdered: Or How I Learned to Stop Worrying and Love My Broadway Bomb. The book was released around the time of a revival production at the East Village's Connelly Theater, featuring script revisions by Bicknell himself (he told Playbill he was “appalled” by the structural mistakes in his original text). Charles Isherwood of The New York Times wrote that witnessing the revival was “among the most insufferable nights” he had ever spent at the theater. Community and dinner theaters over the years have mounted their own versions of Moose Murders, in Queens, and Rochester, New York, as well as in Montana, Ohio, and Oklahoma. The cast of the Rochester performance featured an antiques retailer, a culinary student, and a muralist. The appeal of its terribleness lives on. And Arthur Bicknell seems to have made peace with it. "I kept expecting—you know even the worst plays, people forget about in time," he said. "There is such a thin line between fame and infamy, and I’m almost proud of my infamy ... so many people know Moose Murders. I did that. I wrote the worst play that was ever on Broadway. That’s something."